quality: simple standard stretch film, weak, no crosslinking, little retention force, splice quickly. Stretchwrapper: Simple, semi-automatic stretch wrapping machines equipped with mechanical brake. Use: For simple pallets with straight load schemes. quality: A class of its own! Stiff power film, substitutes all standard films with only 8-14µ thickness, extreme good crosslinking, high retention force, no splice. Stretchwrapper: Simple, semi-automatic stretch wrapping machines equipped with mechanical a. electromagnetic brake. Use: For nearly all load schemes. quality: High End Power film, one side slippery, up to 440% elongation, good crosslinking, high retention force, good puncture resistance Stretchwrapper: Fast fully automatic Stretch wrapping machines equipped with motorized prestretch devices Use: For difficult and heavy pallets with straight or uneven load schemes. quality: Power film, one side slippery, up to 280% elongation, good crosslinking, very high Retention force, barely splice Stretchwrapper: Semi- and fully automatic Stretch wrapping machines equipped with mechanical or motorized brake. Use: For difficult and heavy pallets with straight or uneven load schemes. 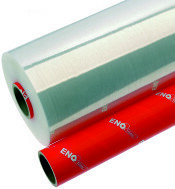 quality: the thinnest pre-stretched films of the market, one side slippery and extremey resistant. Load stability thanks to simple tension. Use: all kind of pallets. Easy use, no Stretch required. An overview of our stretch films as PDF can be found here.